Perhaps the appeal of this book is that, despite being a work of fiction, the idea is entirely plausible. So plausible, in fact, that I found myself wondering if one day the events that unfold in Crimson China will turn out to be factual. Crimson China is based around the Morecambe Bay tragedy, when twenty one illegal Chinese migrant workers drowned and a further two went missing on 5th February 2004. This tragedy haunted Tobin who ‘kept a file of clippings before eventually embarking on the novel in 2007, some three years after the disaster’. Indeed she is finds it poignant ‘that you could journey to a strange land and perish without any lasting imprint of your presence seems unimaginably sad’. The story builds on the possibility that maybe the two workers who went missing did not drown, but survived, somehow evading death by the freezing waters that took the lives of their fellow cockle pickers. From one of the cockle-pickers whose body was never found Tobin creates Wen, an illegal immigrant who is miraculously pulled from the water by Angie who is attempting suicide. As Angie immerses herself in the water she is faced with Wen, seeing this as a sign that now is not the time to take her own life, she rescues him and takes him to her home. Rather than relish in the fact that he survived when so many perished Wen is ashamed of his fate, believing that there are others who deserved to live so much more than him, that he allows the world, including his twin, to believe he is dead. Lili is Wen’s twin, and the other strand to this cleverly woven story. Devastated by the death of her brother she goes to London to find and free Wen’s spirit. Little does she realise that her brother kept many secrets from her, including the price he paid for his migration. Although one would expect emotional melodrama, Tobin ingeniously manages to portray events with a tragic realism that doesn’t call for theatrics. Instead there is a deep rooted emotion here that doesn’t require fireworks, rather it is an aching throb that seeps through the novel. Wen, despite earning less than £2 an hour for most of the laborious jobs he is forced to undertake as an illegal immigrant, rarely complains, nor does Angie who despite being an alcoholic somehow manages to plod through life with minimal self pity. Within this patchwork of underground activity, often fuelled by desperation, is a struggle of identity. Tobin has ‘always been drawn to the notion of identity and culture’. For the Chinese immigrants in her novel, as in real life, living in the illegal Chinese community in Britain is extremely isolating. As one of the characters in the novel insists, the Chinese living illegally in Britain ‘are like shadows, and when a shadow disappears, nothing remains’. 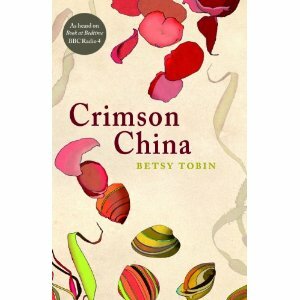 Crimson China is well informed, it realistically represents life as an illegal immigrant and the risks involved. Similarly, even for those such as Lili who arrive with a visa and work as a teacher, Tobin successfully uncovers the mystery of British culture and the battle to maintain your own identity whilst also embracing a new one. At the same time she considers the many different faces of loss and how to deal with grief, whilst all the while creating a novel that oozes survival and maybe even contentedness, even when life is dealing you all the bad cards. Tobin aimed to ‘create a lasting monument to those died: to carve into our collective memory so they would not be forgotten. But also to conjure a tale of hope, rather than despair’. She is successful both by her own standards, and by those of her readers, for she has created a captivating novel with a marvellous realism.